The JR Pass, THE ticket to ride! We had many people to see from Tokyo to Kyoto, Takayama, Kyushyu, Shikoku, and many points in between. The best way for non-Japanese travelers to get around Japan is by train, and the best way to travel by train is with a JR pass. These can only be purchased outside of Japan before you arrive. They can be purchased for 1, 2, or 3-week durations. They are good for all JR trains: local, express, and Shikansen. They are even good for JR buses. They come in two price levels: ordinary and green (1st class). We purchased the ordinary, which was just fine. 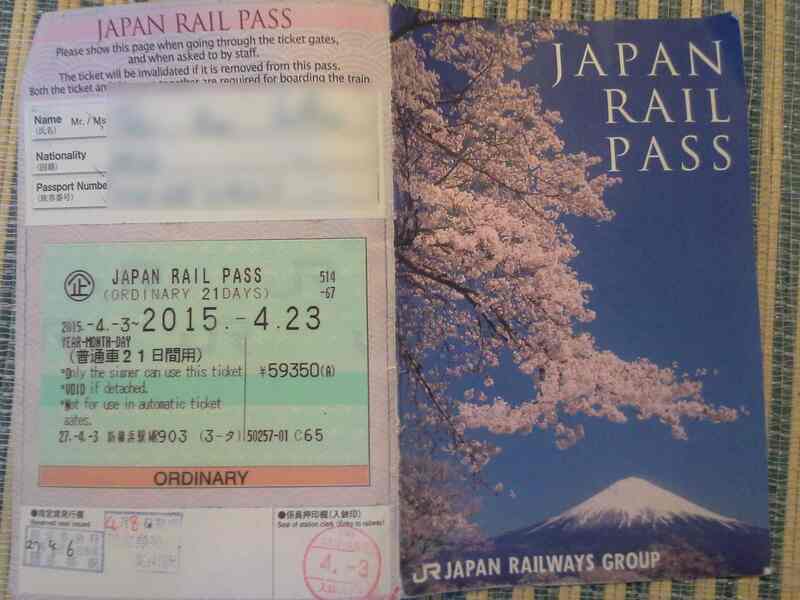 The JR pass is priced in Japanese Yen, so if the exchange rate is fluctuating, you might keep that in mind to time when you buy it. You can’t buy it too far in advance, so read the fine print or talk to your trusted travel agent. So you purchase the JR Pass in your country, then when you get to Japan, the first day you want to use it you go to a JR office and get it stamped. That starts the clock ticking on your 7, 14, or 21 day pass. 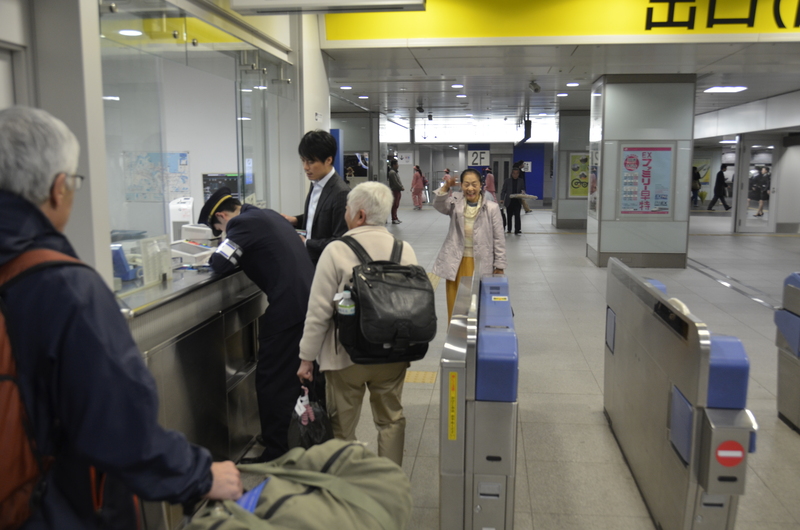 Once stamped you can walk past all the turnstiles for JR local, express and Shikansen trains. Just choose the aisle next to the window and flash the pass and proceed onto your train. There are some restrictions (e.g., the ordinary pass will not allow you on the fastest Nozomi Shinkansen trains). 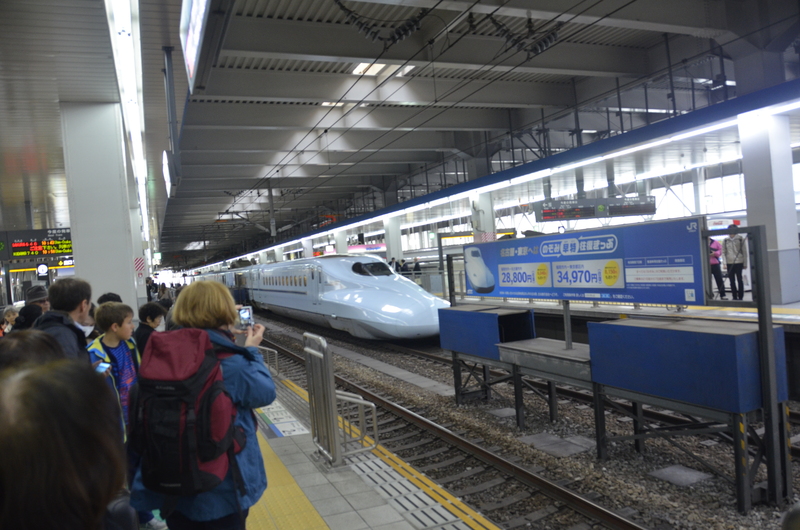 But Shinkansen trains we rode the most, the Hikari and Kodama regularly maxed out at 285 kph / 175 mph. That is plenty fast (here’s a little video of one speeding past a local station). They are comfortable, clean, and spacious. Many offer AC plugs at each row of seats, and you can easily rotate a seat around if you are in a group and want to converse. Eating on the train is acceptable and perfectly coiffed women push carts up and down the train with delicious snacks, box lunches, and beverages. You can always pick up food in the train stations as well. Wouldn’t it be a great if there was a website in the US which listed Amtrak, Greyhound bus, Trailways Bus, local bus and even local flight information, all in one place? There is such a website for travel in Japan. It’s Hyperdia. Enter in origin and destination cities, desired dates and times, and it will present you with all the possible travel options. You can select “more options” if you want to focus on, or remove specific results (e.g. we couldn’t use the JR pass on the Nozomi, so we unchecked that box). Not only does it give you train names, and times, but it even tells you the fare! So you can research your trip before you go to Japan (like I did) to figure out how long it will take to get from point A to point B, and how much it will cost (versus, say, purchasing a JR pass). I was able to plan out our many destinations, calculate the time required to travel, and schedule things out long before we came to Japan. I also called up the website while we were in Japan when our plans shifted. To save time, we ended up taking a domestic flight from Tokyo down to Fukuoka. Note that domestic flights on ANA are greatly discounted for seniors. Trains are running all the time. In bigger cities, Shinkansen trains may leave as often as every 5 to 10 minutes. Even in smaller locations if you were to miss a train you probably could catch another in 20-30 minutes. With a JR pass it doesn’t matter: if you don’t catch one you can simply walk onto the next one. Just be sure to pick out the “non-reserved” seat cars, which are clearly marked both on the cars and on the station platforms. You can reserve seats if you enter a JR office if you want to guarantee seats. Be ready to board, though. The Shinkansen trains stop within an inch or so of the boarding gate and sometimes are stopped no more than 60 seconds. People queue up in an orderly fashion along lines clearly marked on the station platform just to the left or right of the opening train doors. The doors open, those exiting have a clear path to leave, and once they are done, the newcomers get on. Worried about finding the right train, track, etc.? If you use Hyperdia ahead of time, you will know the name and number of the train and more importantly, the time it departs. 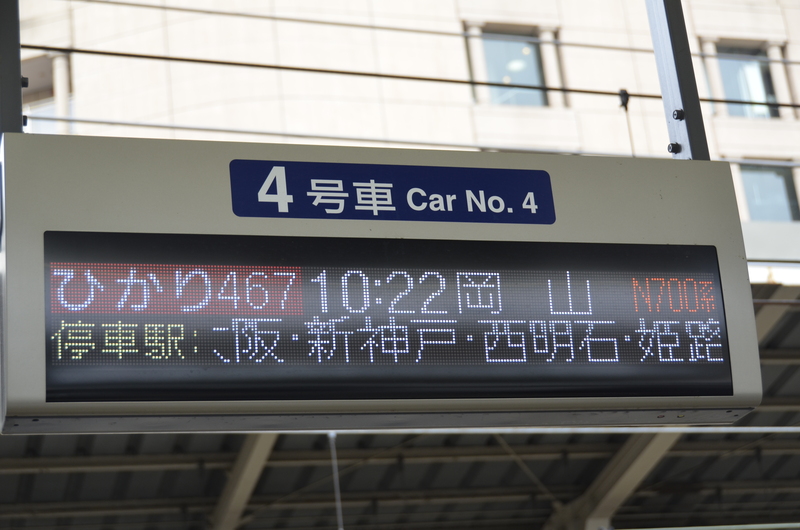 Make note of the train number and departure time and you will have an easy time. 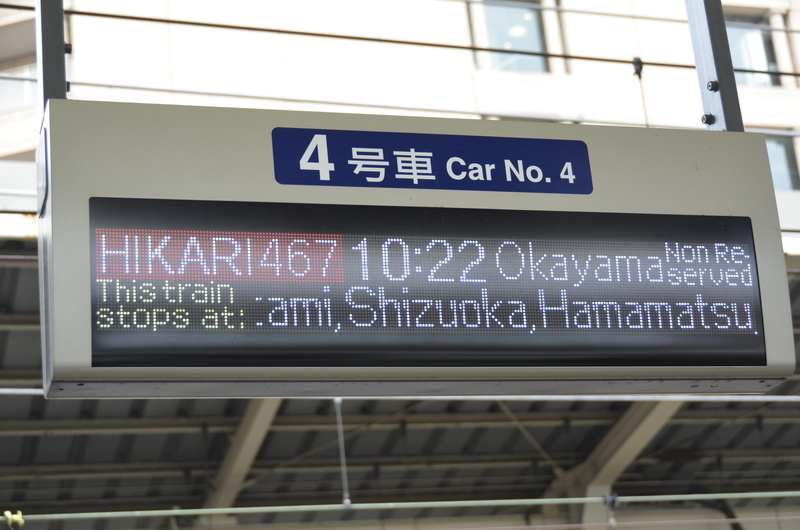 Displays cycle through Japanese and English with the name, track and boarding time for your train. Knowing the time of your train and train number helps you find your train quickly, especially if you are in a large city and consequently have a large list of trains to scan. If you are an American, particularly if you have not traveled in Europe or Japan before and your only experience with travel by train is Amtrak, the standard of train travel in Japan will astound you. If you want to travel great distances, check domestic flights as they can be very inexpensive and save you a lot of time. For example, travelling from Tokyo to Sapporo can take over 8 hours by train, but a flight takes only an hour and 40 minutes, and can often be found for under US$100 one-way. Note that domestic cheap flights appear to only be available within 6 months of travel. Beyond that, prices jump considerably.